Summer isn't complete without some ice cream! After reading San Diego Family Magazine's 6 Unique Ice Cream Parlors in San Diego, I had to make a trip to The Daily Scoop in the South Park neighborhood of San Diego. The cute candy display immediately caught the attention of my two little guys and the "Mom, can I have..." began. See the candy cigarettes in the bottom left corner? Those brought back memories of when I used to buy those from the ice cream man when I was in elementary school. Boy, times have changed! The ice cream at The Daily Scoop is made at Niederfranks Ice Cream in my old neighborhood of National City so I was familiar with the flavors, but that didn't make it any easier to choose. My boys are chocoholics so they choose brownies and cream for one, and triple chocolate for the other. I tried to snag a bite but I was unsuccessful. Sharing was not caring today! Disclaimer: I participated in a Influencer Activation on behalf of Influence Central for OshKosh B’Gosh. I received a promotional item to thank me for my participation. It's almost that time of the year again...Back to School! My sons are super excited that they will now be together at the same school - one in kindergarten and the other in 2nd grade. Back to school clothes shopping for two growing little boys can be a challenge, but our recent visit to OshKosh B'gosh made the experience fun and a breeze! There were so many clothing choices for my boys, not to mention the great sales and discounts. The staff was very friendly to help find sizes and grab items out of reach. My boys did not get bored during the shopping trip. They found a few things to try on while I was browsing the store. They are all too silly! I love discovering new places to eat in Los Angeles. I find myself in the city a few times a year to visit family and friends for all of life's fun events: birthdays, weddings, baptisms, and more. After a fun-filled Saturday celebrating my grandma's 95th birthday, Sunday morning found us looking for somewhere to have a delicious breakfast. After consulting my to go Yelp and Zomato apps, I came across Jack's Whitter Restaurant. Upon entering the restaurant, I got a 60's diner feel which was cool. The decor was kinda retro, but at the same time modern. The host at the front wasn't too friendly. He looked like he has a rough night. I decided to let his negative vibe pass and let the food speak for itself. Our waitress was really nice and offered a few suggestions on the menu. The menu has lots of options for breakfast so there's lots to choose from. The breakfast specialties look all so delicious. 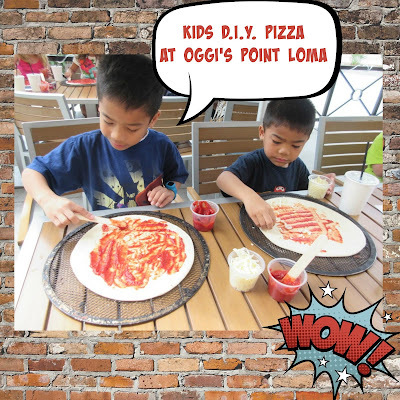 One of our favorite pizza places in San Diego is Oggi's Pizza & Brewing Company. My go-to pizza is the Slam Dunk, pizza brushed with Oggi's unique spicy wing sauce, topped with red onions, spicy marinated all- natural chicken breast and toasted sesame seeds. It's served with our Ranch dip to cool you down. It's got a little bit of spiciness which goes well with it's cheesiness. It's oh so yum! Thanks to Oggi's Pizza & Brewing Company of Liberty Station, the boys and I were able to check out Wednesday Kids Day. They've started a kids do-it-yourself pizza on Wednesday mornings 11 AM. Kids are given a "blank slate" of dough, cheese, sauce, and lots of toppings to choose from. They create their own pizza to their liking! The pizza's looked great when they came out. My kids didn't believe they made those yummy creations! Jelo loves his sauce and pepperoni! Google "haircut phobia". I thought it was just kids who had a fear of getting their hair cut, but little did I realize that many adults have a fear of getting their hair cut too! 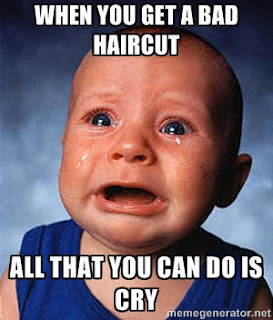 Many share traumatic experiences of getting their haircut as a child which resulted in a lifetime of haircut phobia. My sons first few haircuts were at Pigtails & Crewcuts. But as my kids got older, I tried to take them to a "big boy" barber but it didn't quite work out. During our last visit, my youngest son cried the entire time wiping his tears and spreading bits of hair all over his face and into his eyes and mouth. We left with half a haircut and an upset little boy. When I asked him why he cried, he simply said "I don't like it there." Maybe it as too grown up for him. No smiling hair stylist. No fun colors and cool chair to sit in. No kiddie movie to distract him. So, to avoid a lifetime of haircut phobia, back to Pigtails & Crewcuts we went!